Filipino actor Paolo Ballesteros won the award for "Best Actor" at the 2016 Tokyo International Film Festival on Thursday. 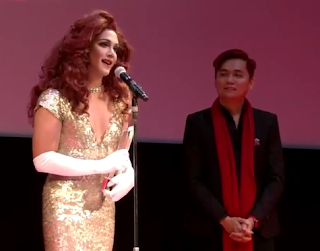 The award is for Ballesteros' role as a transgender woman named Trisha in the movie "Die Beautiful." In his acceptance speech, he said he was surprised about the award and thought he was only attending the red carpet event for the closing ceremony of the festival, which celebrates its 29th edition this year. He also thanked the organizers for "embracing our film." "Die Beautiful" also received the "Audience Choice" award. Directed by Jun Robles Lana, the movie centers around Trisha, who makes a living by joining beauty pageants. She unexpectedly dies while being crowned in a beauty contest. Before she died, her one last wish was to be presented as a different celebrity on each night of her wake. However, her conservative father wants to bury her as a man so her friends are left with no choice but to steal her body and hold the wake in a secret location. While they transform her to look like different celebrities, they look back at the colorful and extraordinary life that she has led - being a son, a sister, a mother, a friend, a lover, a wife, and ultimately, a queen.